"They're back -- in their mummy's arms!" 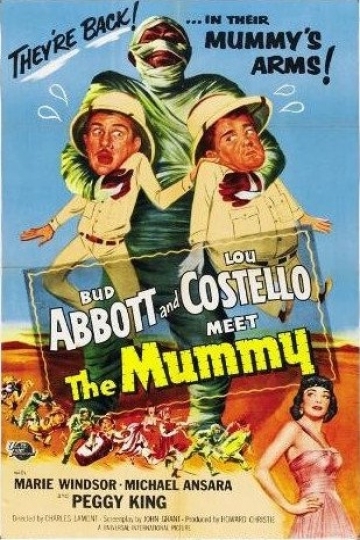 Pete and Freddie (Abbott and Costello) overhear a Cairo archaeologist's chatter about discovering a legendary mummy and decide to apply as chaperons for the corpse's journey to America. But when they arrive at the archaeologist's home, he has been murdered, the mummy seems to have have disappeared, and to top it all off, the boys become owners of a sacred medallion that holds the key to the location of an ancient buried treasure that many would kill for! Abbott and Costello Meet the Mummy is currently available to watch and stream, buy on demand at Amazon, Vudu, Google Play, FandangoNow, iTunes, YouTube VOD online.